The term The Big Three is commonly used to describe the items that are usually the heaviest and costliest part of a kit: pack, shelter, and bedding. We care a lot about keeping our pack weights as light as possible, but care even more about functionality, first searching for models that meet our use requirements, and then choosing the lightest option. The total weight of the big three for the two of us is 175 ounces (10.9 pounds, 4.96 kg), or 5.5 pounds per person. This is heavier than what ultra-light hikers carry, but is substantially lighter than most novice backpacker’s loads. The packs and sleeping quilts in the following discussion are only available for purchase directly from the manufacturers: these are tiny American companies that specialize in making lightweight gear. They have exceptional reputations for quality and customer service. If you order an off-the-shelf product you can return it unused if you are not pleased. For instance, if uncertain about pack size, it’s reasonable to order two sizes and return the one that doesn’t fit properly. 52.7 Tent: Big Agnes Copper Spur HV UL2. 47.7 oz tent, includes 6 stakes and stuff sack. 35.8 Home made Love Bird Quilt. 27.0 Pads: Thermarest NeoAir Xlite. 25.7 oz for two 20x72" pads. Free-standing, so we can easily move it around to find the most level and least lumpy spot. When we don’t need the fly we can set it up with no stakes. When setting up with the fly we need a minimum of two stakes, or four stakes for windy conditions. This makes it very easy to set up on a beach, on a granite slab, or on the plywood decking of open-sided shelters. Ability to set up a shelter that is just insect netting, so we can have bug protection and concurrently have a full view of our surroundings. We always want bug protection, but when the weather is mild we rarely put on the rainfly. For this reason we limit our selection to double-wall tents. Double-door configuration, so even when the fly is on we can fully open both long sides of the tent. We like the convenience of two doors and two vestibules, and it provides for great ventilation options. Floor dimensions to be just big enough for our two pads and a little bit of gear. Because we have adequate vestibule space we don’t need to bring all our gear into the tent. We don’t want anything bigger than that because it makes it more difficult to find and prepare a site. Interior space voluminous enough for the two of us to comfortably sit and eat. Sufficient roof ventilation to reduce interior condensation problems. Surprisingly, there are still tents on the market with no high vent. Subdued color, because we don’t want to add visual clutter in wilderness areas and we don’t want to draw attention to ourselves when stealth camping. 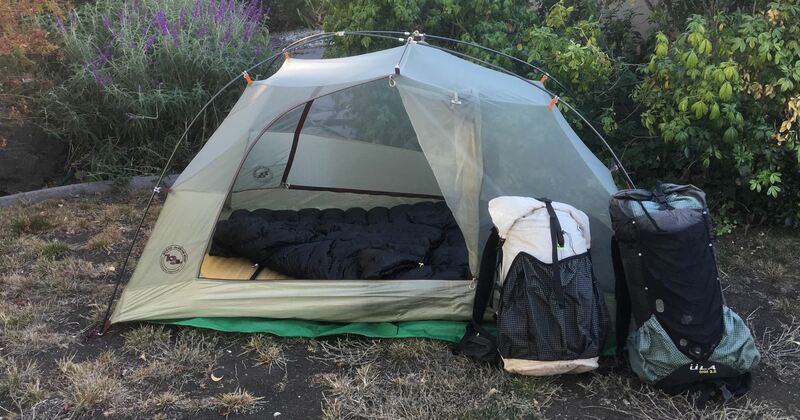 The Big Agnes Copper Spur HV UL2 tent is perfect for us. It meets all of our requirements and with 6 stakes weighs in at a hair under three pounds. All of the major tent brands make two-door, double-wall tents; the Copper Spur is the lightest. Note that Big Agnes makes several different models that share the Copper Spur name. The HV version means high volume and it is the model that has head clearance at the foot end of the tent. The Copper Spur Platinum is similar, weighs less, costs more, but does not have as much internal volume. The Tiger Wall UL2 has a similar architecture and identical dimensions and weighs 9 ounces less, but it is not available in a stealth color and is not truly free-standing; it would be a terrific choice for a hiker who does not embrace those two requirements. Many ultralight hikers carry innovative lightweight shelters from Mountain Laurel Designs, TarpTent, ZPacks, HMG, or other small manufacturers. We have used some of these shelters and studied many of them in the field. We have made a decision that we are willing to carry more weight in order to have the conveniences we prefer. 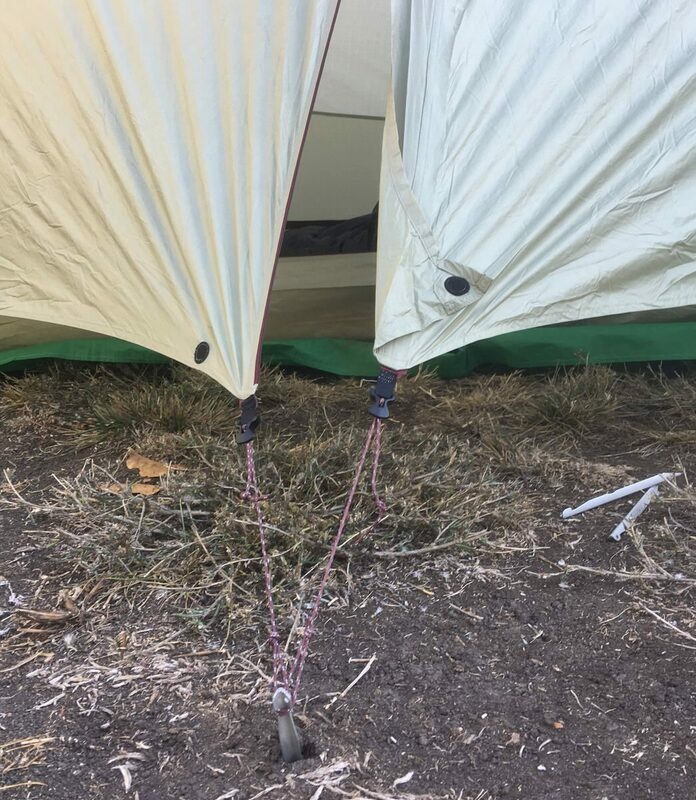 We added LineLoc 3 Guy Line Adjusters and reflective cord to the four corners of the tent body and all tieouts on the fly. We have found this model of tensioner far easier to use than other types. Zpacks sells these items; while you’re there buy some of their 1.2mm Z-Line Dyneema Cord and Tiny Cord Locks, two items that we use frequently. We attached the LineLocs using 0.5″ GrosGrain Ribbon. 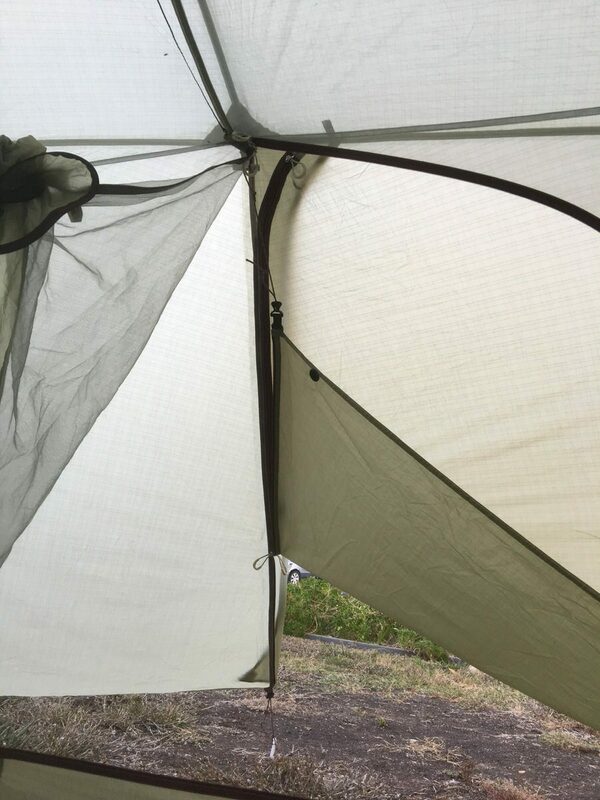 We added tieouts to the second flap on the doors on both sides of the tent. This allows us to stake out either flap depending on weather conditions. It also allows us to secure both flaps to the stake in very windy conditions reducing strain on the zipper. We added a button to the interior of the fly door near the top of the zipper. 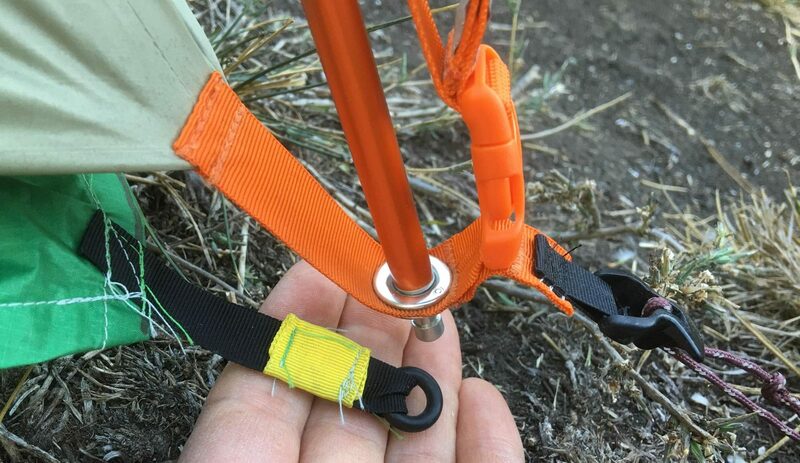 This allows us to zip the door half-way and fold the bottom of the flap up and loop the tieout string around the button, a useful configuration during rain in mild temperatures. We made a ground cloth out of 0.75 oz Spinnaker Cloth. This is very tough fabric which we have used for years for this purpose. 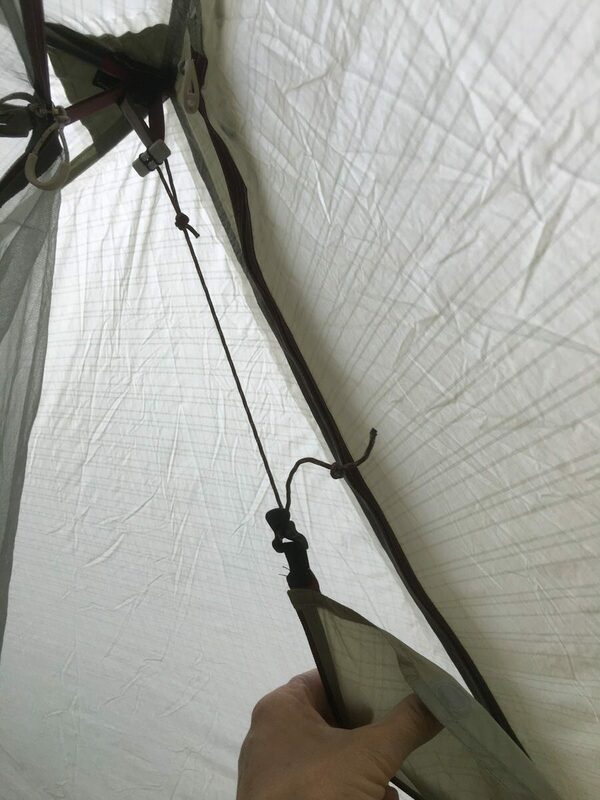 We put rubber o-rings (9/16 OD x 5/16 ID) at the corners which snap over the ends of poles and allow us to pick up the tent and ground cloth as a single unit. This also keeps the ground cloth from shifting around under the tent. The majority of long-distance hikers use quilts, sometimes called top-quilts, instead of sleeping bags. Bag insulation under your body does not add value since it is compressed when you lie on it. A quilt can be wrapped around the side of your body, but does not extend all the way beneath you like a sleeping bag does. Compared to a mummy bag, we have found that a quilt with a good sewn-in footbox is just as warm, weighs less, is more comfortable, and is more versatile for use in a wide range of temperatures. We have been using home-made double top-quilts for decades. We currently use two Love Bird Quilts. One weighs about 36 ounces and is warm down to about 20 or 25 F. Our warm weather quilt weighs about 29 ounces. The three companies listed in the table make great single and double quilts. When choosing a double quilt, there are two factors that require particular attention. The first is preventing drafts between the people; the three options in the table have draft flaps to address that issue. The second factor is the width of the footbox; it needs to be wide enough for two people to still love each other in the morning. The inner circumference of our Love Bird Quilt’s footbox is 78″ (32″ wide by 7″ tall). That is perfect for us; no surprise since we designed it after lots of experimentation. My brother owned a Nunatak Dual Arc with the original narrow footbox, and four of five couples who tried it found it unusable. Nunatak now offers a Dual Arc with a wider footbox. Before purchasing any of these double quilts, mock up different sized footboxes using a blanket, and then talk to the manufacturer to find out which one has an inner circumference that best meets your needs. There is a common misconception that the pad should go inside the quilt. This is not the case; you want the quilt to snuggle up against your body and putting the pad inside the quilt creates big air gaps. The Thermarest NeoAir XLite is the lightest weight pad that we find comfortable enough for a good night’s sleep. We carry the 20′ x 72″ pads. Some hikers carry the Women’s NeoAir, which is shorter (66″), weighs the same, and has better insulation value. We prefer not to hang our feet off the end of the pad so we opted for the longer pads. If you inflate the NeoAirs by blowing into the pad, then you get a lot of internal condensation. We use a bag to inflate the pads; the bag can be a trash compactor bag, or a large silnylon or cuben sack. We usually use a large cuben bag which doubles as a stuff sack for organizing gear. We use three home-made pad couplers to link our pads together so that a gap between them does not open up while we are sleeping. Our couplers are figure eight loops of 3/4″ grosgrain ribbon and have sliding clips to which we can attach the edges of our quilt. We would be interested trying a double sized mat instead of using coupled individual pads. The Exped Synmat HL Duo looks appealing, but it weighs 29.3 oz compared to 25.7 oz for our pair of NeoAirs. We hope Thermarest adds a dual NeoAir XLite to their lineup. We both started carrying ULA packs back in 2002. Jim has been happily using the ULA Ohm 2.0 since 2009. This pack suits him, but might be a little too minimalist for a hiker used to a full suspension backpack. He changed the inner thin closed cell foam back sheet to a thicker egg-crate type of foam to better damp out the sharp corners on various items he carries in the pack. From 2010 to 2016 Amy used a ULA Circuit, which we think is a perfect pack for a hiker making the transition from traditional loads to lightweight backpacking. Occasionally Amy tries out different models. Experiments with Osprey and Gossamer Gear packs lasted only one trip, after which she returned to the tried and true ULA Circuit. At the beginning of 2017 she took the Hyperlight Mountain Gear Southwest 3400 on a trip and found it to be even more comfortable than the ULA Circuit. It is significantly more expensive than the ULA Circuit, but for a hiker who is not price sensitive this is a dream pack. We cut all extraneous straps off of our packs, so ours weigh slightly less than advertised. We never check bags on flights; the Ohm, the Circuit, and the HMG 3400 can be carried on. I’m tempted to make the leap to an HMG pack, and like you would use it as a carry-on, but I’m worried the actions of other airplane passengers might destroy the bag – people can be rather rough with the overhead bins. Considering the risk for puncture with DCF (Cuben), how do you normally stow the HMG 3400 as a carry-on? Or is puncture vulnerability overstated? Scott, we’ve stowed our packs in the overhead bins on every trip we’ve taken and have never had a problem with any model of pack. It doesn’t strike me that the HMG pack is any more susceptible to puncture than the ULA packs. My husband and I are planning on hiking the Tokai Shizen Hodo this spring. We are already on the road (south-east Asia currently) and are carrying a non-free standing tent with us. Do you think we can make this work, with a bit more searching for spots, and sacrificing sheltered spots here and there? Or is a free-standing tent an absolute necessity to hike the TSH? Thanks a lot for your blog, very helpful for newbies like us. Sorry for the very late reply; we’ve been out traveling. We’re excited that you have decided to hike the Tokai Shizen Hodo and hope you enjoy it as much as we did. We always find that a free-standing tent offers more options, but many people use non-free-standing tents successfully. On many nights we camped on platforms, and if you do the same then you’ll just need to find rocks or other objects to tie out the corners, whereas with a free-standing tent you can just drop it down and climb in. If you decide to inquire about camping on the grounds of temples, then you will have more options than we did, as we were never bold enough to inquire. Good luck, and please let us know how your Tokai hike turns out.